Florence, a Renaissance city in the heart of Tuscany, has some of Italy's best museums with many famous paintings and sculptures, beautiful cathedrals and churches, interesting streets and squares with elegant buildings and shops. Florence is located in the north central Tuscany region of Italy and can be reached by train from the Cinque Terre (3 hours). Spending only one day in Florence is almost overwhelming. Here you will find the top attractions, most lie in Florence's compact centro storico.In high season Florence can become very crowded. We highly recommend you to book your tickets to the major museums and other tourist sights online in advance. 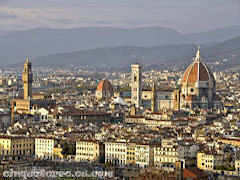 Basilica di Santa Maria del Fiore is the cathedral (Duomo) of Florence and the most popular tourist site. The huge Gothic Duomo was begun in 1296, consecrated in 1436, and holds 20,000 people. Climb to the top of the cathedral for great views of Florence. The Baptistery of John the Baptist (Battistero di San Giovanni), from the 11th century, standing in front of the famous Duomo is one of Florence's oldest buildings. Its exterior is made of green and white marble and has three sets of amazing bronze doors. Inside, you can see some mosaics and a marble pavement of the zodiac. 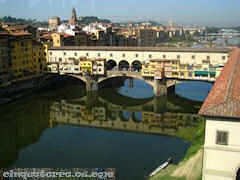 The Uffizi Gallery (Galleria degli Uffizi) is one of the world's top art museum. It houses some of the most important works of the Renaissance, including works by Leonardo da Vinci, Giotto, Botticelli and Michelangelo. The Accademia Gallery (Galleria dell'Accademia) houses Michelangelo's David, easily the most famous sculpture in the world. Once inside, you'll also see Michelangelo's unfinished and powerful Prisoners, along with a few works by Perugino, Giambologna and Botticelli. Ponte Vecchio, the oldest of Florence's six bridges, is one of the city's best known images and the only bridge to survive World War II. The National Museum of the Bargello (Museo Nazionale del Bargello) is located near the Piazza della Signoria and houses some of the most incredible sculptures from the leading artists of the Renaissance era. Such as works from Michelangelo, Donatello, Ammannati, Bandinelli and others grace the interior of this great museum. The Pitti Palace (Palazzo Pitti) and Boboli Gardens (Giardino di Boboli), on the southern bank of the Arno, encompasses several museums and holds paintings from some of Italy's most celebrated masters. The Renaissance gardens are a delight.